When I was a little girl, I loved acting out Bible stories with my mom, especially the one about Mary Magdalene meeting the Risen Lord. I would be Mary, kneeling in front of the old Franklin stove that passed for the garden tomb, my shoulders heaving with imagined sobs. My mother would be Jesus. We’d run through the dialogue, and when my mother said “Mary,” I’d gasp and throw my chubby arms around her legs. It was a fun way to pass a winter afternoon, but it also brought up questions I wouldn’t have thought of if I hadn’t immersed myself so fully in the story. Why didn’t Mary recognize Jesus? Was she blind? Did he look different, and if so, why? Was Jesus a person, or a ghost? It wasn’t until years later that I realized how unusual my experience was—that many children have never even heard the stories of biblical women such as Deborah, Hannah, and Dorcas, much less been encouraged to put themselves in their shoes and imagine what their experiences must have been like, or how their stories are relevant to the lives of girls and boys today. Which is why I’m so grateful that Caryn Rivadeneira has stepped in to fill the gap with Grit and Grace, an engaging middle-grade book retelling the adventures of seventeen biblical women. Grit and Grace isn’t the typical Bible story book. Rivadeneira has fleshed the biblical accounts out with fictionalized details and dialogue that add life and color, without stretching the bounds of credibility or decentering the biblical account. The writing style is more reminiscent of Beverly Cleary than Elsie Egermeier and her iconic Bible stories. Rivadeneira’s most daring—and most moving—choice was to write the stories in first person, allowing the biblical women and girls to speak for themselves. In fact, I found myself tearing up while reading several of the stories, not because they were emotionally intense, but because it was the first time I had heard them told from the perspective of the women themselves. Rivadeneira does not sugarcoat or shrink back from the difficult realities of her subjects’ lives. Esther is not portrayed as a beauty queen, but as a girl who was taken from the protection of her loving home. Leah discusses the awkwardness of her family situation, and Mary talks about how hard the flight to Egypt was. Rahab explains that she “never wanted to be a ‘harlot,’ as many called me. . . but the money I sent (home) ensured that my little sisters would never end up like me” (p. 35). Rivadeneira’s frank storytelling is not troubling or traumatic, but it is far more truthful than many retellings aimed at children, or even adults. The damaging effects of patriarchy are addressed in an age-appropriate way, without reducing the women to victims who lacked agency. They are portrayed as spirited women who lived full lives in a very different society; women who girls and boys nowadays should be able to relate to on a deep level. Each story in Grit and Grace includes a reference pointing readers to the biblical account; the character’s approximate age (if known) and the era in which she lived; “fast facts” deepening the reader’s understanding of the story; questions to ponder; and a prayer prompt. The questions are particularly good, relating the stories to the readers’ own lives and inviting them to reflect honestly on the hard issues the story brings up, without fear of giving the “wrong” answer. Abram and Sarai’s treatment of Hagar, Rahab’s lie, and Hannah’s decision to leave Samuel at the temple are all on the table for discussion. 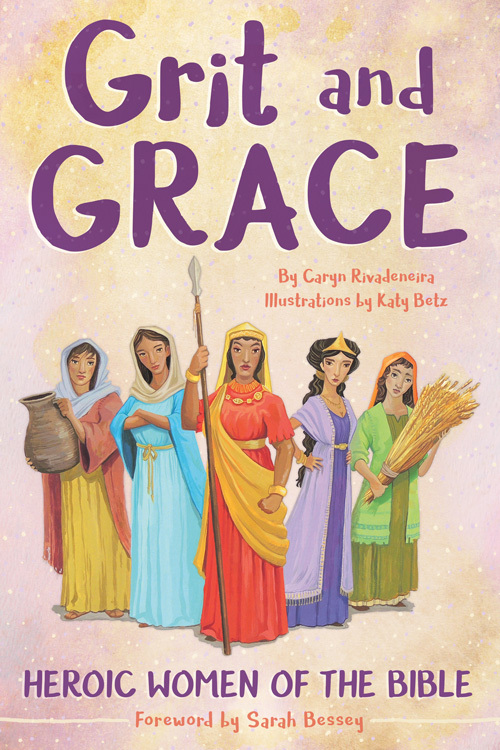 Grit and Grace is an empowering, thought-provoking, and eminently readable book that will help late elementary to middle school children get a grander sense of how God worked through women and girls in biblical times, and how he wants to work through all his people today. It would make a great gift for girls graduating out of their church’s children’s ministry, or for any child who enjoys reading middle grade books about real-life circumstances. My only complaint is that this book hasn’t been around longer! It has been sorely needed. How Much Money Does it Take to be a Good Christian Woman?